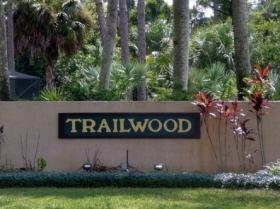 Trailwood is a small HOA community located off of Indiantown Road in Jupiter Farms. This intimate community consists of single family homes in a cozy one-mile loop that surrounds a large lake. Homes range in size from 2,400 to 6,000 square feet with lots from half an acre up to two acres, with lots of space between each house. Enjoy well manicured lawns and common areas, lush, mature trees and a family friendly community. Very low HOA. Just minutes from I-95 or Florida's turnpike interchange, and just 15 minute drive to Jupiter's beautiful beaches and waterways. One Story 5 BR + Den/Study;4 Bath; Well maintained smartly designed charming (see virtual Tour) home. Generously proportioned spaces and plenty of sunlight throughout.wood,stone & granite finishes in all the right places. Spacious entry veranda and backyard lanai with screened and heated pooL .3 min from 95. 1.4 acres ( room for guest house):built in 2000 ,This home has a whole house purification system plus reverse osmosis in the kitchen.